All transactions are safe and secure with a reliable history in online purchasing behind each of our associates. Buy the Rocky Costume Robes to own Rocky clothing and merchandise. 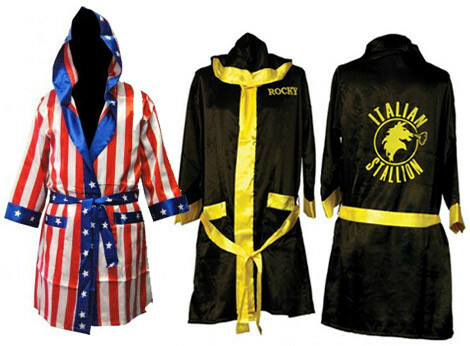 Warm up for the big fight in one of these attractive Rocky costume robes. Several styles are available, including a black Italian Stallion robe with gold trim and this American flag robe worn by both Rocky and Apollo Creed before their fights with Ivan Drago. Just don't get too cocky like Apollo did before his fight. A great looking Rocky robe doesn't always mean you'll win. Wear it over your favorite Rocky shirts for a knockout ensemble. Each robe is sized to one size fits all. In addition to the Rocky Costume Robes above, browse the Rocky Clothing Gallery for more apparel like men's and women's clothes, kids shirts or hoodies.